I need to share a remarkable story of a fitness professional in the fight of his life. He is someone I have long admired. Someone I have shared the stage with many times. One of the best presenters I have ever heard. A wildly successful entrepreneur who has earned more accolades in his storied strength and conditioning career than most can dream. Peter Twist is one of the most successful trainers and performance coaches of ALL-TIME. His business, Twist Sport Conditioning, is a world-class training & performance facility in Vancouver, Canada, with franchises in the US and Canada. For eleven years, Pete was an NHL strength coach. And since then, has devoted his life to helping kids and adults become their very best. His passion and energy are infectious, his intelligence is incredible, and his spirit is unbreakable. As a matter of fact, Pete may be in the best shape of any forty-seven year old I know, male or female. With the fitness and conditioning of an elite pro athlete, he looks like he can still suit up and play. And dominate! But life took a strange turn earlier this year. Out of nowhere, Pete was diagnosed with Stage 4 Nasopharyngeal cancer (head/neck) that had spread throughout his lymph system. He was asymptomatic when he first went to the doctor in January 2011 (just about a year ago), and has been through hell and back since then, fighting one heckuva fight to force this thing into remission. He would tell you himself that this has been tougher than any fight he has ever faced in his long and successful hockey career. I recently had dinner with Pete at his home in Vancouver. It gave us some quiet time to sit and talk. About fitness. About our industry. And about life. What a conversation it was. I asked Pete if I could share his story, it truly is inspirational, because not many people know of his battle. As a matter of fact, for four of the hardest months earlier this year, only six people even knew Pete was sick. More know now, but the chance to share Pete’s story here with you is a chance to share some of the most IMPACTFUL words I have ever heard from another person. There are “deep lessons” from Pete’s journey, and I share them with his blessing and his hope that they might empower others in a similar battle for their health or other challenge in their lives. When the truth of the situation was revealed, doctors found a tumor the size of a baseball located about 2 mm from the brain stem. A thorough diagnosis placed the chance of survival for three-years at 25%. What followed was brutal. Two months of chemotherapy and radiation at the highest intensity one can receive. When I asked what that felt like, Pete described it as “severe burning of my mouth, face, and neck from the inside out.” Taking in nutrients was next to impossible; requiring “thirty minutes under layered pain-killers to get down a glass of vanilla protein drink.” Knowing Pete, he was probably yelling like a gladiator to get it down and get it done. I learned that the effects of head and neck radiation continue to accumulate for five to seven weeks post-treatment. That means the side-effects get worse and worse even after treatments stop. Pete said this was one of the most frustrating parts of the entire experience. We talked about life lessons and as always, his words were deep and introspective. “QUARTERBACK YOUR OWN HEALTH AND OWN THE PROCESS” Doctors: oncologists, nutritionists, naturopaths, chiropractors, you name it – all come from different backgrounds, academic paradigms, and philosophies. Many of them do tremendous work, but are often overwhelmingly busy in their day-to-day and guided by the ‘system.’ It is critical that YOU determine what is right for YOU and take charge at each step. Quarterback your health and quarterback the team you assemble for any acute challenge in life. Pete went in because of a premonition, a gut-call that something “wasn’t right.” He really had to press to get the right team together and get the tests done to eventually be diagnosed and then treated because he looked healthy. Had he waited until symptoms appeared, the results may have been…. DON’T PLAY THE VICTIM CARD. It took a tremendous amount of grit and determination for Pete to get this far in the fight. He doesn’t like “wearing the cancer hat.” When going to the hospital for chemotherapy and radiation, he would drive his car “straight to the top” of the roof of the cancer center and park. He did not want to park where it said “PATIENT” painted on the wall. He would enter the parking garage with inspirational music cranked (AC/DC or POD if I know him!) and later would say, “Is that all you got? Give me your best shot!” After each radiation and chemo treatment, he would attempt to exercise right away, sometimes right in the parking garage. Literally. HEAL FROM WITHIN. Look beyond traditional nutrition guidelines and organic foods and invest in a deeper understanding of all the variables affecting cellular health. WOW. Don’t wait until there’s a problem to start training like an animal and begin living TODAY like it’s your last day on earth. Powerful words. BREAK ALL THE RULES. “You must be willing to change YOUR rules: to adopt healthful strategies that give you an edge, to step up and break from the traditional medical model, to return to action.” Pete is an example that we are capable of more than we might be told. Fight to give EVERY effort any moment to build your physiology and physicality. Work at YOUR pace – not the pace of the average sick person. Not the pace expected by the disease model. Be willing to do everything it takes to get back to where you were. Act on your personal pride, conviction, and your will to live “FULL ON” for yourself and all those around you. Pete’s words really stuck with me. He is an incredible man and truly inspirational. He ended his story with this (and I will paraphrase): Growth comes from challenges and of these, there are very few that will force you to draw upon absolutely one hundred percent of every single element of your being. One hundred percent of every personal resource within you. When one of these challenges presents itself, it will be an amazing opportunity. After the anger and fear have ripped through you, after you face your sadness and concern for loved ones, be sure to see the amazing opportunity you’ve been given. The battle will become a set of scars you carry with quiet pride and deeper gratitude for the chapters ahead of you. The personal growth is strong and real. Don’t be bound up or held back from the beating you’ll take. Springboard from it and let it ignite every single day for the rest of your life. My evening with Pete ended with some “HEALING FROM WITHIN.” Pete’s diet for this past year has been mostly raw vegetables and a concoction of organic foods, supplements, and powerful antioxidants to fortify his system. So when he asked me if I would like one of his “desserts,” I willingly obliged. It was here I was introduced to what I now call “Twister’s 27-Ingredient Jungle Juice.” This “shake” has so many things in it I can’t remember them all. Three times a day for almost a year: cabbage, broccoli, spinach, raspberries, blueberries, cranberry juice, greens mix, fish oils, and many other “goodies” in it. Sounds disgusting, huh? Pete said, “You think this tastes horrible? Try cancer and then tell me if you like it.” Despite not knowing all that’s in it or if there are really twenty-seven ingredients, by the end, it tasted real good! For me, that night, sharing Twister’s 27-Ingredient Jungle Juice was a spiritual moment. Pete is now almost one-year post diagnosis. He powers UP mountains running and laughs rambunctiously as he races down; he lifts hard and heavy again in his Twist Sport Conditioning Center and does wind sprints like he did when he was competing. He’s teaching again and back in the trenches making a difference. But most of all, he’s enjoying life and is as vibrant and FULL OF LIFE as I’ve ever seen him. Thank you Pete Twist for the man you are. The trainer you are. And the friend you are. I hope your story IMPACTS thousands of people to live their BEST LIFE EVERYDAY just as you do. Thanks brother! Todd Durkin, MA, CSCS, is an internationally recognized performance coach, personal trainer and massage therapist who motivates, educates and inspires people worldwide. He is the owner of Fitness Quest 10 in San Diego, CA, where his wonderful team of 35 focuses on personal training, massage therapy, Pilates, yoga, sports performance training and nutrition to help transform the bodies, minds and spirits of a broad clientele. Todd trains dozens of NFL and MLB athletes. He is the head of the Under Armour Performance Training Council, serves on the Gatorade G-Fit Team, and is a featured presenter on the Perform Better educational circuit. He is a two-time Trainer of the Year (IDEA & ACE). Additionally, Todd provides motivational talks and programs to companies and conferences worldwide. Men’s Health recently named his gym, Fitness Quest 10, one of the Top 10 Gyms in the US. Todd has appeared on 60 Minutes, ESPN, NFL Network and has been featured in Sports Illustrated, USA Today, Business Week, Prevention, ESPN the Magazine, Men’s Health, Men’s Fitness, Men’s Journal, Stack Magazine, Self, Shape, Fitness, the NY Times and Washington Post. Todd has authored 35 DVDs on strength and conditioning, functional fitness, massage/bodywork and business/personal growth. His new book, The IMPACT! Body Plan, debuted in September 2010 and is a 10 Week program designed to create world-class fitness and life performance. You can sign up for Todd’s FREE award-winning Ezine newsletter, the TD TIMES, at www.FitnessQuest10.com or www.ToddDurkin.com. WANT TO USE THIS ARTICLE IN YOUR EZINE OR WEBSITE? You can, as long as you include this complete blurb above with it. If you would like a Word Document of the article sent to you, please email us at durkin@fitnessquest10.com to let us know and we will be glad to supply it to you. The weekend is upon you and temptation is all around. Parties, barbecues, restaurants, wine and beer are all calling your name. With Thanksgiving and Christmas around the corner you brace for the carb onslaught. This is when you are really tested; you have to balance your reluctance to undo all the hard work you did throughout the week with the realization that weekends and holidays are different for a reason. This is a time to decompress, reconnect with loved ones, or go out on the town; it only makes sense that you would eat differently on weekends and special days. Trying to eat the same way that you do the rest of the week is simply not realistic, nor should it be! Does that mean you should have four slices of pizza, a pitcher of beer and a hot fudge sundae every weekend? No! Nonetheless, you should not beat yourself up over a glass of wine or a slice of apple pie once in a while. Lifestyle change rather, than a short-term diet, is the key. Naturally, everyone needs to restrict somewhat in order to get their weight under control. However, these changes should be sustainable. Eat less sugar, more protein, and more fruits and veggies. Your grandparents were right all along! The key is in the compromise. Rather than downing half a bottle of red wine and five slices of sourdough bread with butter, opt for a single glass and one delicious slice of bread (dipped in olive oil of course!). There is no need to throw in the towel just because you ate a little treat, but just don’t order every treat on the menu! The key is balance. Change from a negative “diet mentality” to a positive “healthy lifestyle mentality”. Keep in mind that if you make exceptions and over indulge every weekend, holiday, office birthday, midnight snack and family get together, the exceptions start to become the rule! One of my most successful weight loss clients, Susan, did not make a change in her lifestyle for the first year we trained together. She was resistant to giving up things that were ingrained in her lifestyle. She loved her Dr. Pepper, ice cream, and beer on the weekends. And there was no way she was going to do any extracurricular cardio! When it came time to renew her training sessions with me I, asked her to think about why she was going to spend more money and not make a change. Susan finally had the epiphany. She made trade-offs without going into an extreme diet. She gave up the diet Dr. Pepper and kept on eating the ice cream, but not as frequently. She still drank some beer, but did an hour interval walk-run by the beach after work. She lost 30 pounds. Four years later, she has not gained back a pound. Should you find yourself really cheating, resist the urge to have an “all-or-nothing” mindset. All hope is not lost. Remember that the minute you begin eating right again, you are back on track. If you happen to overeat a little do some extra cardio to ease your guilty conscience, and burn a few more calories. Avoid the diet mentality. Do not obsess over restricting yourself; think of adding good things rather than just removing bad things. It is also imperative that if you do cheat, you do it with gusto! Enjoy your sneaky little secret. Don’t hide it. Do not feel guilty and do not avoid the frosting (it’s the best part)! I know this sounds counter-intuitive, but this is the only way to avoid that vicious and restrictive dieting cycle. (Besides, after cutting out much of the sugar from your food, you will feel so much better that you won’t even want to eat a lot of the bad stuff—and you won’t feel good when you do) Remember that if you feel too restricted, you will always be susceptible to the “rebound effect” with the ultimate consequence—a lifetime of yo-yo dieting. This will satisfy your cravings and you’ll end up feeling less bloated and guilty. If you love mashed potatoes, try steaming cauliflower and mashing or blending it with a little butter, sour cream, and garlic. You get the same mouth feel and flavors without all those carbs and calories. If you love rice reach for the basmati brown rice, quinoa, or pearl barley—all of which have a lower glycemic load than their white cousin. Another, more novel idea, is to have your salad at the end of your meal. It’s not a dessert, but it can be just as refreshing. To be in a position to win, you need to have a game plan. Healthy eating is no exception. A useful analogy to illustrate this point is how I learned to win more consistently at tennis. Only when I learned how to develop a game plan in each tennis match did I begin to really win matches more frequently. I picked out my opponents 3-4 weaknesses and made that my plan. For your eating plan, an example would be: eat lean protein, avoid potatoes and bread, eat more veggies with every meal, and add fish oil daily. When I hit a shot into the net or long over the baseline, (having too much wine or a piece of chocolate cake) I did not stress. I knew that I had a game plan and that as long as I went consistently for those shots, I would win. I knew I would miss many shots throughout the match, which is only natural. but in the long run, I was clear about my mission and I was able to finally relax and not worry about losing individual points. I had a smile on my face for the whole match. In your fight for health, your opponents do not stand a chance. You will make more shots than you will miss, and in the end you will prevail. Lifestyle changes are the key to lasting and satisfying success. The weekend is a time to relax, so don’t stress out over eating a few treats when you’re out to dinner with your friends. Make a healthy lifestyle the goal and you will make better decisions more times than not. Embrace new, healthier foods and activities. Once in a while you can reward yourself with some of your old favorites. If you “cheat,” it is important to avoid the “all-or-nothing” principle. Just enjoy it and go right back to your healthier ways of eating. To minimize cheating, make sure you eat healthy foods that satisfy your craving. Eating chocolate is as much about the creamy texture as the taste, so substitute a food with a similar feel and you will be satisfied. The most important thing is to be clear on how to eat a healthy diet this is your “game plan,” and if you stick to your game plan you can lose a few points along the way and still win the game. So just relax and realize that if you don’t overly obsess over hitting your target, you will likely hit that target more often and with greater ease. Craig Valency is a Certified Personal Trainer and is a Certified Strength & Conditioning Specialist through the National Strength & Conditioning Association (CSCS). He works at Fitness Quest 10, where he specializes in developing holistic training programs that promote lifestyle changes for permanent results in weight loss, athletic performance, & whole body functional strength & fitness. He earned a bachelors degree from UCLA, and has completed coursework in Kinesiology & Exercise Physiology at UC San Diego & Miramar College. He is currently pursuing his Masters Degree in Kinesiology at San Diego State University. His name is Dewey Bozella and he just fought his very first professional boxing match on October 15, 2011. He won. Dewey Bozella is 52 years old. Yes, my friend, that’s correct. At 52 years of age, Dewey Bozella finally had the chance to live his dream – the dream to be a professional boxer – the dream that kept him going for most of his life. You see, for 26 years, Dewey lived behind bars for a murder he didn’t commit. Several times he was offered a plea bargain. Freedom, if only he would say he was guilty. According to Dewey, he would rather “rot in jail” than say he did it. More than once, he made the painful decision to refuse the plea. An innocent man in prison for 26 years. No stranger to pain. His father beat his pregnant mother to death when he was only nine years old, and two of his brothers were murdered on the streets of Brooklyn while he was just a teen. This man’s entire life was filled with pain. Twenty-six years is nearly 10,000 days. All that time Dewey dreamt and worked for one thing: the day he would walk away from prison a free man, and have the chance to fight as a professional boxer. In 2009, justice was served and he did walk away free. He was exonerated of the crime after a quarter of a century spent trying to prove his innocence. What a path to travel to achieve your dream! Just last month, Dewey Bozella fought Larry Hopkins on the undercard of a Bernard Hopkins (no relation to Larry Hopkins) fight. Dewey won by a unanimous decision and immediately afterward said, “I used to lay in my cell and dream about this day happening. It was all worth it. It is my dream come true. This is my first and last fight…I did what I wanted to do and I’m happy.” He fought. He won. And then he retired when his dream was realized. My friend, what about you and your dreams? Likely, you aren’t in prison. Likely, you haven’t faced the battles Dewey faced. But each of us has walked a unique path to arrive where we are today. We’ve faced challenges and struggled through adversity. And now, more than ever, our dreams are so important because dreams do keep us alive. They empower and motivate us. They give us purpose and put meaning in every day and every action. Dewey Bozella got up each day for 26 years and lived with purpose. He never gave up and neither should you. Let your dreams do their magic. Allow them to fuel your day, give you energy, and keep you focused. They’ll do all this and more. It doesn’t matter if it takes 6 months, 6 years, or 26 years to achieve, never give up. You’ve got to make your dreams come true. Dewey Bozella is an amazing example of someone who very easily could have given up many times. Can you imagine nearly 10,000 days of wrongful imprisonment? He could have lived with rage. He could have lived with anger. He could have lived with hatred. He could have given up on any one of those 10,000 days. But that’s the thing that makes Dewey Bozella so special. He didn’t. Instead, he CHOSE to live with PURPOSE. He chose to DREAM. What a great lesson this man is for all of us. Regardless of circumstance, hardships, turmoil, adversity, or situation, choose to keep fighting. Choose to keep persisting. Choose to keep believing. And always choose to keep DREAMING. After all, dreams can come true. Time for a “Peak” Experience? I hope 2011 is off to a wonderful start for you and your family and that you are feeling reenergized and rejuvenated after the holidays. Spend more time in nature. Nature quiets the mind and inspires deep thought. The splendid beauty of nature allows for reflection, gratitude, and empowering thoughts. For me, the mountains invoke peace and solitude. Find what works for you and commit to finding peace and solitude in your life. Travel to inspiring places. If you knew you had only 6 or 12 months to live and wanted to travel somewhere special, where would you go? Don’t wait! Don’t put off today what you could be enjoying tomorrow – not 5 – 10 years from now. Book that special adventure and enjoy some outrageous fun this year. Create peak moments. Peak moments are created. Don’t wait for them to just happen. Make sure your 2011 is filled with peak moments. Last week’s ski trip will undoubtedly be a peak experience for my year. As a matter of fact, my opening message here is from the “PEAK” of the mountain in Park City, Utah…Enjoy it …AND THEN SOME! I wish you and your loved ones a New Year full of adventure, inspiration, and peak moments. America lost a fitness icon this week. Jack LaLanne, the Father of U.S. Fitness, passed away of pneumonia on Sunday, January 23rd at the ripe age of 96. For years, Jack LaLanne had said, “I can’t die, it would ruin my image.” I love the humor in this quote from a man who defied the odds over and over again. A sugar addict as a kid, he changed his life at 15 by swearing off flour, most fat, and sugar and concentrating on eating fruits and vegetables. He opened the first modern health club in the US in 1936 in Oakland, CA. It was equipped with a gym, juice bar, and health food store. Think about the timing… we were still in the Great Depression… Jack LaLanne was gutsy and bold like no other. In 1951, he started his own TV show. This is where he made famous his one-piece jumpsuit zipped open halfway down his chest with “Jack” stitched over his heart. His show was on air for decades. At the age of 45, in 1959, he did 1,000 pushups and 1,000 chin-ups in 86 minutes. At the age of 70, in 1984, LaLanne shackled and handcuffed himself to tow 70 boats with 70 people 1.5 miles in Long Beach Harbor. Up until his death, he did 90 minutes of weightlifting and 30 minutes of swimming everyday. He continued to preach the gospel of exercise, raw vegetables, and clean living. Choose to exercise today… choose fresh fruits and vegetables… Build your kingdom and live a long, healthy and inspired life. Spread IMPACT! Thank you Jack for impacting me as a fitness professional and being a role model for so many people on how to live life to the fullest. I hope you are having an IMPACT-ful day. I have 3 quick things I would like to share with you that I think you will enjoy. Please watch the video below to see the opening video and find out what “S.O.U.L.” is all about! I hope you are doing fantastic. 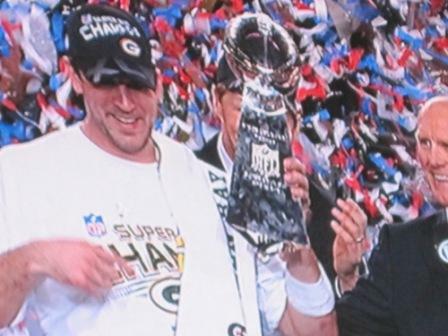 Were you one of the record-setting 110 million television viewers of Super Bowl XLV on Sunday? If so, you witnessed a very special win by Aaron Rodgers and the Green Bay Packers. I mentioned in last month’s feature article that my theme for 2011 was “S.O.U.L.” The “O” stands for “outrageous fun and adventure.” And let me tell you, my entire Super Bowl XLV experience was extremely adventurous and fun. Between the snow, ice, sleet, rolling black-outs (all of which made the week interesting), Radio Row appearances, work with Gatorade at the Gatorade Sports Science Institute, and work with Under Armour – the week leading up to the big game was a good one. And of course, there was the game. Fitness Quest 10 client Aaron Rodgers turned in a magical MVP performance to lead his Packers to an historic Super Bowl win. Together with long-term FQ 10 client and LB/Special Teams ace Matt Wilhelm, they shared a memorable victory with Packer fans and all of Green Bay. Today’s feature article, The Things You Can’t Measure, shares my recap of the game and how you can step up your game in your quest to be the best. Create a SUPER day! Peace and God bless.